Happy Monday everyone! I'm so excited to be playing along one more time with the wonderful Skipping Stones Designs DT. This time I'm sharing a card using the newest newest Skipping Stones Designs set, Victorian Christmas! The Victorian Christmas set is full of lovely wintery images (think ornate flourishes), but I was especially taken with this beautiful tree image. I clear embossed it onto pure white card stock then blended different shades of blue ink over it. 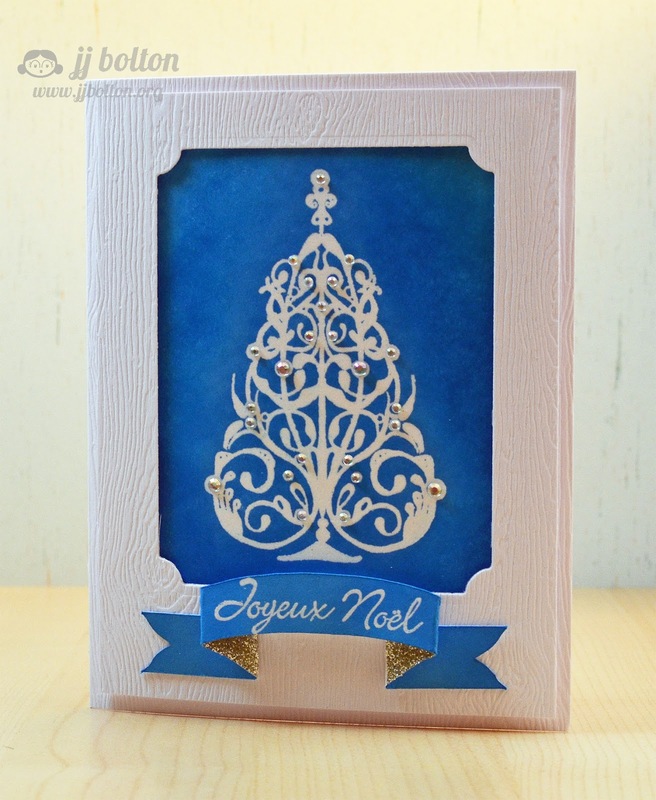 The tree design is full of swirls and circles that are perfect for embellishing. 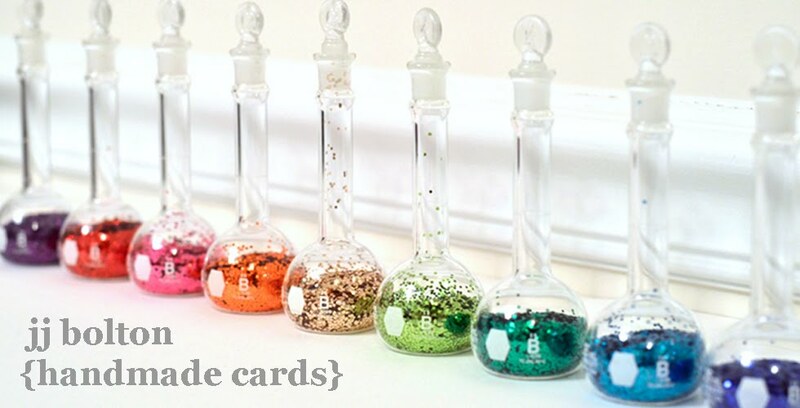 I chose to use clear gems, but pearls, Stickles, or a glitter pen would be wonderful too! For the sentiment, I created a curved 3D folded banner with my Silhouette. For a little more sparkle, I covered parts of the back of the banner (just the parts that show) with silvery glitter. Click here to download the Silhouette studio file for the banner. I hope you pop on over to the Skipping Stones Designs Blog to see the fantastic SSD DT Victorian Christmas projects. My buddy Miriam is also playing along, so don't forget to stop over at her blog too! Thanks so much for stopping by and have a wonderful week! So pretty JJ! I love the blue/white combo, and I LOVE the gold sparkle you added! This is stunning! Love the color combo- so sophisticated! This is just stunning! The deep blue with the white is amazing! Oh you are calling to me with this one JJ!! 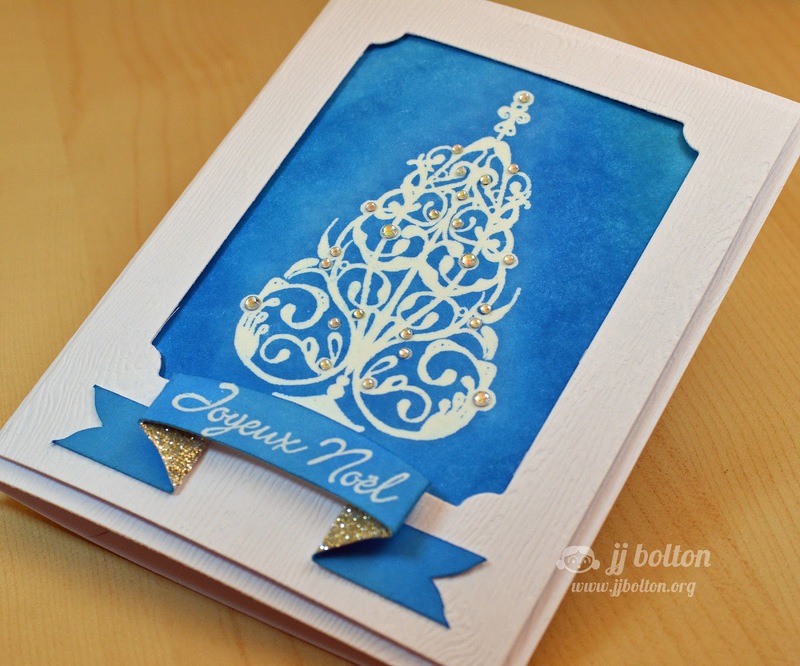 I love that bit of gold peeking out under the sentiment, the pretty blue and of course all those gems on the tree! You are showing off again and this one isn't even C&S! Well done girl! A lovely design and the banner adds a great finishing touch. I love the deep blue! And our town has a "Victorian Christmas" theme for its parade & lights every year :) That banner is so fun - love the funky tails & the great glitter addition! So elegant and I love the glitter peeking through from the other side of the banner!!! Aloha, JJ! That glittery goodness peeking out from under your banner is to die for. What a fantastic detail!! !